Medium chain triglycerides, phosphatidylcholine (from soy lecithin), beeswax, rosmarary extract, vitamin E and ascorbyl palmitate. Softgel consists of gelatin, glycerin and purified water. Carob and caramel extract added as a light barrier. Take 1 softgel per day with a meal, or as directed by your qualified health care consultant. Medium chain triglycerides, phosphatidylcholine (from soy lecithin), beeswax, rosmarinic acid vitamin E and ascorbyl palmitate. Softgel consists of gelatin, glycerin and water. Carob and caramel extract added as a light barrier. Medium chain triglycerides, phosphatidylcholine (from soy lecithin), beeswax, rosmary extract, vitamin E and ascorbyl palmitate. Softgel consists of gelatin, glycerin and purified water. Carob extract and caramel added as a light barrier. Take 1 softgel per day with a meal or as directed by your qualified health care consultant. Medium chain triglycerides, phosphatidylcholine (from soy lecithin), beeswax, rosmary extract, vitamin E and ascorbyl palmitate. Softgel consists of gelatin, glycerin and water. Carob extract and caramel added as a light barrier. The Most Bioavailable and Active Antioxidant Form of Co-Q10! Ubiquinol is the reduced (active antioxidant) state of Co-Q10, the form produced by our cells and is significantly better absorbed as a supplement, particularly as we age. 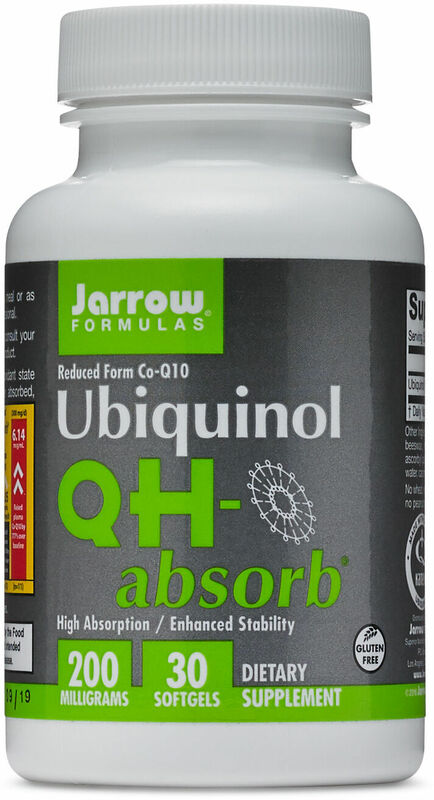 Jarrow FORMULAS QH-absorb is a proprietary enhanced stability formula, which has been clinically shown in humans to increase Co-Q10 levels up to 777% (6.14x) over baseline at 300 mg per day intake.